See how easy it is to build apps lightning fast for your company — or grab prebuilt apps with a few clicks from the AppExchange. In this step-by-step guided tour you’ll see how easy it is to build engaging, connected apps. 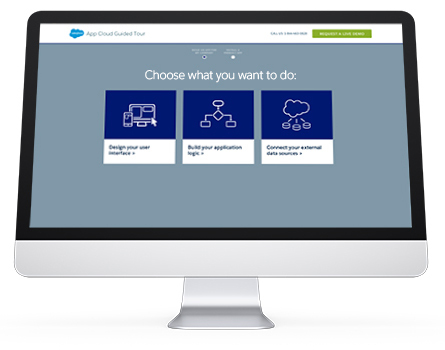 Using tools like Salesforce Connect and Lightning App Builder, we’ll walk you through the drag-and-drop ease of building on the world’s #1 enterprise app platform. Sign up for a quick guided tour.